Cloudy skies early, then partly cloudy this afternoon. High near 55F. Winds NNE at 5 to 10 mph.. Contributed photo Eight-year-old Gage Crump crosses the finish line at the annual Salmon Fun Run. Contributed photo Salmon River Fun Run winners were Lovina -Eugland-Barry Green 10K;Emma Stommen and David Martinez 5K;Maureen Guido and Aaron Heisey 1/2 Marathon. Ron and Ruth Mahurin will be honored at a send-off reception Sunday, Sept. 22, at 2 p.m. PST, at the IOOF Hall in White Bird, Idaho. They are moving, come wish them well. Desserts and refreshments will be served. Tell your friends and neighbors to join this celebration. A celebration of life for our dear friend, Clyde Hirst, is this Saturday, Sept. 15, 2018, at 4 p.m., in the Idaho Banana Co. Orchard. Bring a chair, a story, and fond memories of Clyde to share with his family and friends. Clyde died July 19, 2018, while working at the Riggins City Park on his dream stage; Clyde’s dream will live on for so many others to perform on stage in style in Riggins, Idaho. The fifth annual Riggins Salmon Run was very exciting with 60 terrific runners and many wonderful volunteers and lots of great sponsors to help make it a successful event. Winners were awarded to first female and first male in each section: half marathon winners-Maureen Guido and Aaron Heisy; 10K winners-Lovina Eugland and Barry Green; 5K winners-Emma Stommen and Davie Martinez; run for 6 years and younger winner was Darby Fitch. Angie at Gradient Shift donated all the prizes as well as making the runners shirts and medal ribbons. Mariah Crump, coordinator of the run, wishes to thank all the sponsors, the runners, and the volunteers for helping make this run a fun run and great family time. Looking forward to seeing all of you and more next year. SRHS has only three home football games: Friday, Sept. 14, with Prairie; Oct. 5, homecoming with Cascade; and Oct. 26, Senior Night with Council. All games begin at 7 p.m. MST. Away games are Sept. 28 with Horseshoe Bend; Oct. 12 with Garden Valley; and Oct. 19 with Tri-Valley, also at 7 p.m. Get up to the SRHS football field and cheer on our football players. SRHS volleyball home games for September: Tuesday, Sept. 1, 6 p.m. with New Meadows; Thursday, Sept. 20, with Cascade; Tuesday, Sept. 25, with Council at 6 p.m.; Saturday, Sept. 29, Garden Valley at TBA. Away games: Sept. 13, Garden Valley at 6 p.m.; Sept. 18 at Tri-Valley; Sept. 22 at Grangeville —tournament time TBA; and Sept. 28, Horseshoe Bend at 5 p.m.. Get on up to the SRHS gym and cheer on our volleyball players. Volunteers are needed at the SRHS volleyball games in the concession stand; contact Tracie Pottenger on FB or Rhonda at 208-628-2770 if you can work an hour or so each game. Royal Rangers and Girls Ministries at the Riggins Assembly of God Church will begin tonight, Wednesday, Sept. 12, and will meet each Wednesday. All kiddos and teens in our community are invited to join them every Wednesday after school. Youth group meets at Salmon River Community Church Sunday evenings at 5 p.m.; all teens in the Salmon River Canyon are invited to attend. Jason and Julie Fitch McClanahan will be at Salmon River Community Church, Sunday, Sept. 30, to share about their mission work at Shiloh Bible Camp in Donnelley, Idaho. Yoga in the Canyon has been committed to our Salmon River Community for more than a decade now. Mariah has recently stepped up her game to RYT500; “the upgrade was the best,” she said. She is now adding classes and refining her offerings. “Life is meant to be rad…meet me on the mat,” challenges Mariah. Yoga classes in Riggins are Monday-Friday 8:30-9:30 a.m.; Tuesdays 6-7 p.m.; Thursdays 4:30-5:30 p.m. White Bird classes are Monday and Thursday 10-11 a.m. PST. Restorative Yoga 2nd Wednesday 6-7:30 p.m. Fitness class with Joy Tuesday and Thursday 10-11 a.m.
Work continues on the stage project in the Riggins City Park; huge thanks to the crew: Fred Shank, Mike Lyman, Rob Means, Dale VanTassel, and Pastor Mike Chapman for carrying on the project. These guys have removed the old stage and framed up the addition to tie in to the new stage. More volunteers are always appreciated; donations are still needed to complete the stage. Kudos to MIDAS Gold Idaho for its very generous donation of $10,000 to the stage project; MIDAS Gold Idaho has also offered to match money donated and labor hours volunteered, up to $5,000, between July 27, 2018-March 31, 2019. Thanks to all who have supported this project. Contact MaryLou Hirst if you would like to do volunteer work, donate money or supplies, or help in any way. Recycling News: until further notice, no plastics can be accepted at the Riggins Recycling Center as the Lewis and Clark location has no outlet for plastics. Unfortunately, all plastics are currently going into the dumpsters. The city hopes to find another location for plastics as soon as possible. There is an ongoing pet drive for animal shelters who are in need of pet toys, beds, treats, food, and old towels and blankets. Matt Laine at Wild Rivers Adventures is collecting items to donate; just drop off your items at his shop on North Main Street. 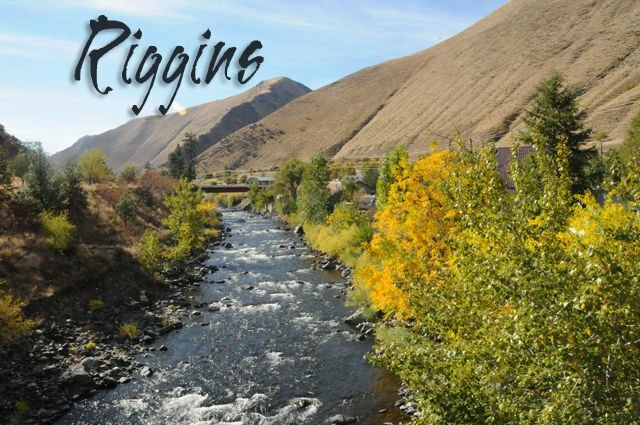 The Salmon River Art Guild extends an open invitation to all regional artists 18 and older of fine art media to enter the 2018 Regional Art Show in Riggins in October at the Riggins Community Center. Prize money of more than $1,000 will be awarded in oil/acrylic, watercolor/water media, other…pastels, drawing, mixed media…, sculpture, and photography. More details will follow in the next few weeks. Leighton Vander Esch News: NFL is proud to announce that 2018 NFL Dallas Cowboys 1st Round Pick Linebacker Leighton Vander Esch will have his first public autograph signing in Dallas, Texas, Tuesday, Sept. 18, 2018, 6:30-7:30 p.m., at Gameday Connection, 3000 Grapevine Mills Pkwy #616, Grapevine, Texas 76051. If you are unable to attend the event, they are accepting mail order and drop-offs. All items must be received by Sept 12. Signing courtesy of Waukesha Sportscards In Demand Autos & Wholesale Sports Daily.